Here we have a collection of jewellery which doesn't quite fit in with the other categories. This includes Peruvian items which are made with semi precious stones and non tarnishing Alpaca Silver, Kabbalah jewellery and just other unusual or pretty things. There are currently 9 items on this page. 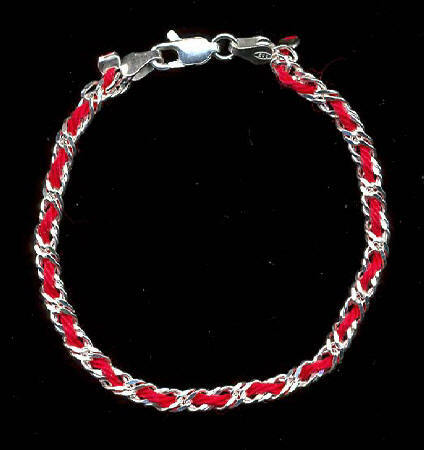 has genuine Kabbalah Red String woven through a Sterling Silver chain. Kabbalah (Kabbala, Kabala or Qabala) is an aspect of Jewish mysticism. Some aspects of Kabbalah have been studied and used by non-Jews for several hundred years. and smaller Silver spacer beads. Length : 8 inches with a Silver lobster catch. handmade in Peru in a 'mask' pattern with Alpaca Silver. Cat's Eye is said to stimulate intuition and awareness. Iridescent purple Cat's Eye Quartz choker from Peru. This pretty necklace is made from Alpaca Silver, which does not tarnish. set with a pale blue glass cabochon. all dangling prettily from an Alpaca Silver chain. this beautiful Alpaca Silver anklet is my favourite. and pretty pink glass seed beads. Length ~ 8inches with lobster clasp.